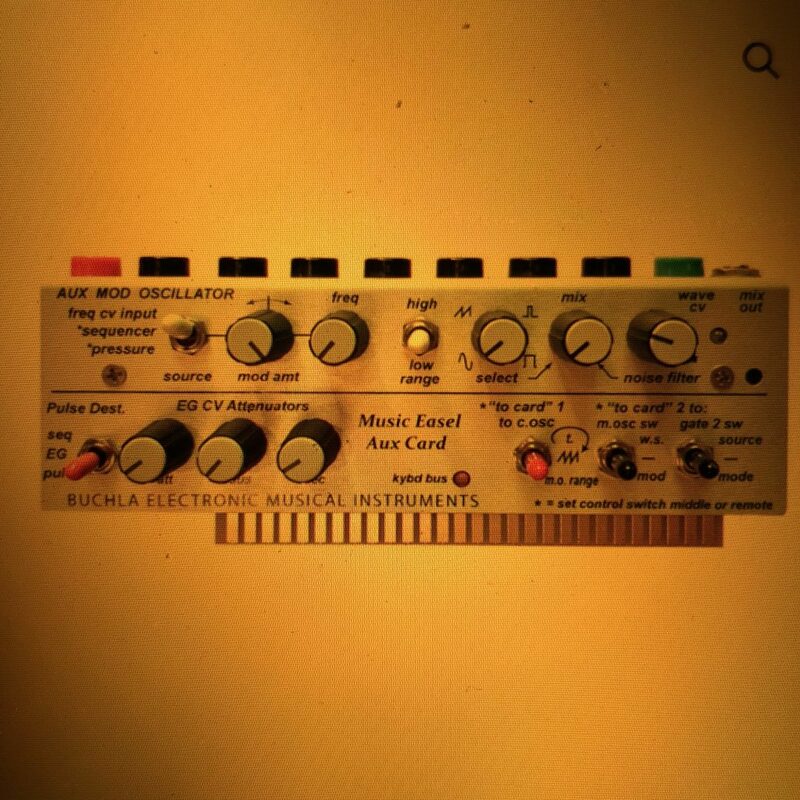 I don’t have this Buchla Music Easel aux expansion card (which is why you are getting this sweet screenshot) but I like the idea of it. I’ve mentioned already that one of the lures to the Easel is it’s limited options which force creativity and lead you into unexpected places. I find that limitation to be equal parts thrilling and frustrating. Thrilling because if you know me then you know my pull towards simplicity anywhere I can find it, and frustrating because sometimes I really just want it to do something and can’t figure out or can’t see the method to make it happen. This aux card adds and extra oscillator which is the thing I find myself wanting more than anything. It does other things too, but that’s what I’m most interested in. I’ve never seen one in person and BEMI isn’t selling them directly anymore and their list of distributors who sell them doesn’t seem to have anyone with them in stock, ever. Maybe with the purchase of BEMI by Buchla Music that just happened they will be available again. I think it’s a great idea and the perfect aesthetic match is a nice touch too. I’m not sure if it’s clear what is going on in this photo, but I’ll try to explain. I’ve never really understood polarity inversion with cv, I mean I get that it goes from + to – but in my experiments to date I hadn’t really seen much effect. Then it clicked. 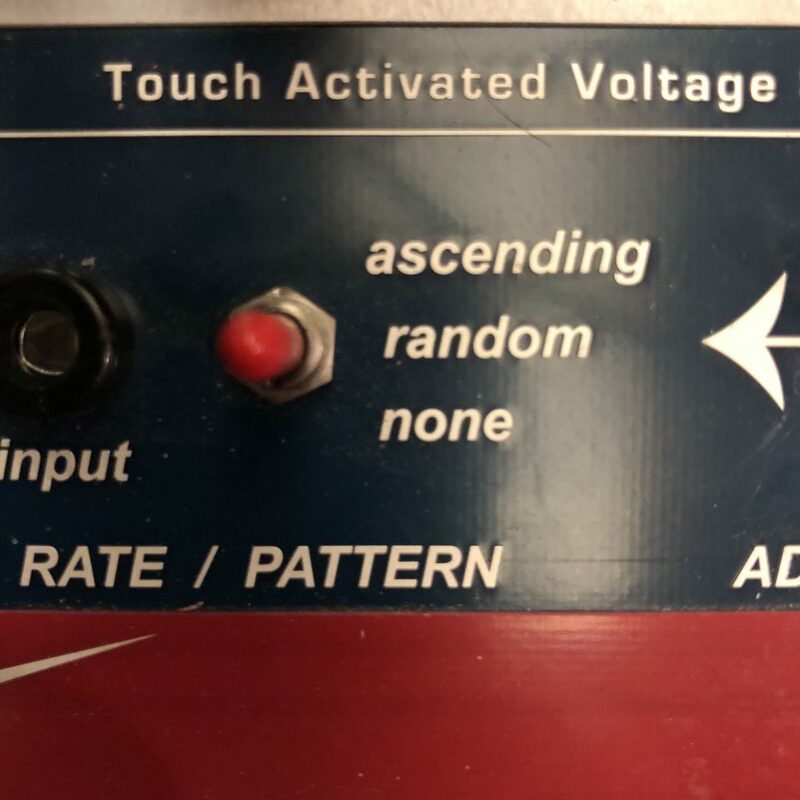 So what I’m doing here (and you can hear some of this in the video I posted on Instagram earlier) is starting off with an envelope with a very slow attack hitting the mod oscillator on the Buchla Music Easel, then I’m separately running the envelope through the inverter and then applying it to the complex oscillator. The result is that the mod osc has a slow attack but then decays quickly, and the complex osc has a faster attack but decays much slower. I’m driving this with a pulse from my eurorack system so that it’s clocked similarly, and then adding reverb on the end which is creating some lush and beautiful spacey atmospheric soundscapes. I’m really liking where this is heading and feel like an album is beginning to develop. I need to make some tape loops to layer in and then we’ll see what’s what. I’ve always felt more comfortable with some creative limitations. Give me every option in the world and I get lost in trying to decide what is best, but give me only a few and I dive right in. It’s easier for me to think about what I’m making when I don’t have to spend time worrying about how I’m making it. This is freeing, but it’s also frustrating at times, and it bounces between the two regularly. With the Buchla Musice Easel I find myself loving what it does while simultaneously wishing it did a little more, or that I had just that one more option to do that one thing I can’t figure out how to do, and then finding a way to do it and being really excited, and then feeling like maybe I’m just doing the same thing each time. I have to push myself to try something new, to go a different direction – while still going the direction I enjoy. I know how to do a lot of things with it that I’m not really interested in, and I want to understand how to do more of the things I’m really enjoying with it. Forcing myself to spend so much time with it this month is helping with that, rewiring my brain a bit. I love the Forse series and his explanation, and it makes me wish I’d learned more about music theory growing up so I wouldn’t feel like I’m playing so much catch up in my 40’s. And while I can’t imagine coming up with 3 double albums of incredible material in just a month, like he did – I do hope I walk away from this with something to show for it. If it feels like I missed a day that’s because I missed a day. Basically I decided I needed to move a few things in my synth closet and ended up staying up all night ripping everything apart and it was a serious disaster. Anyway, it’s all coming back together now. The new arrangement puts a few pieces closer that are possible bridges between systems. 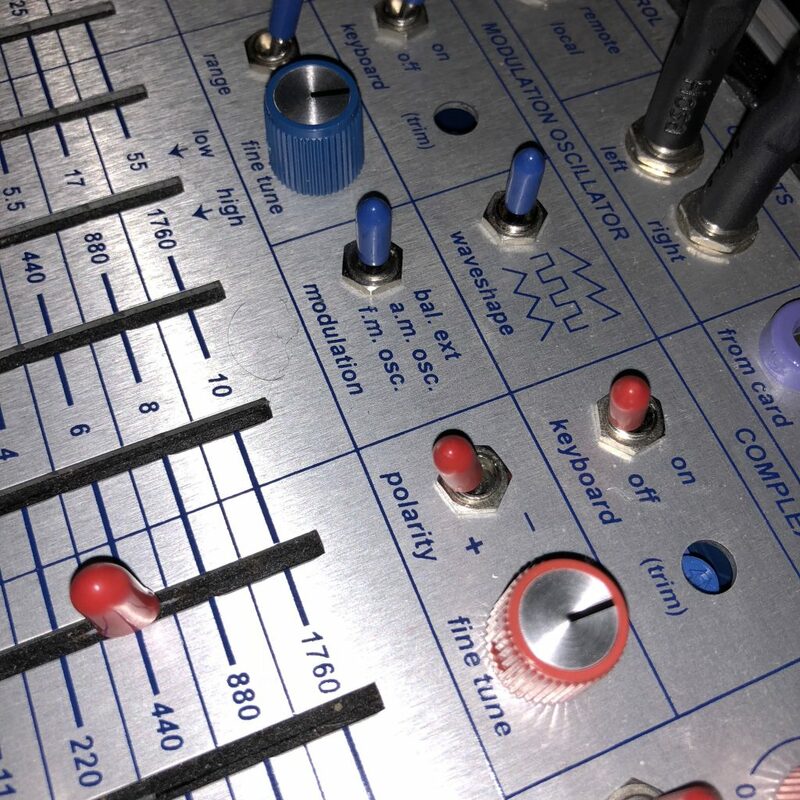 Of course there is the audio in into the Buchla Music Easel which I’ve never used but often thought about using. 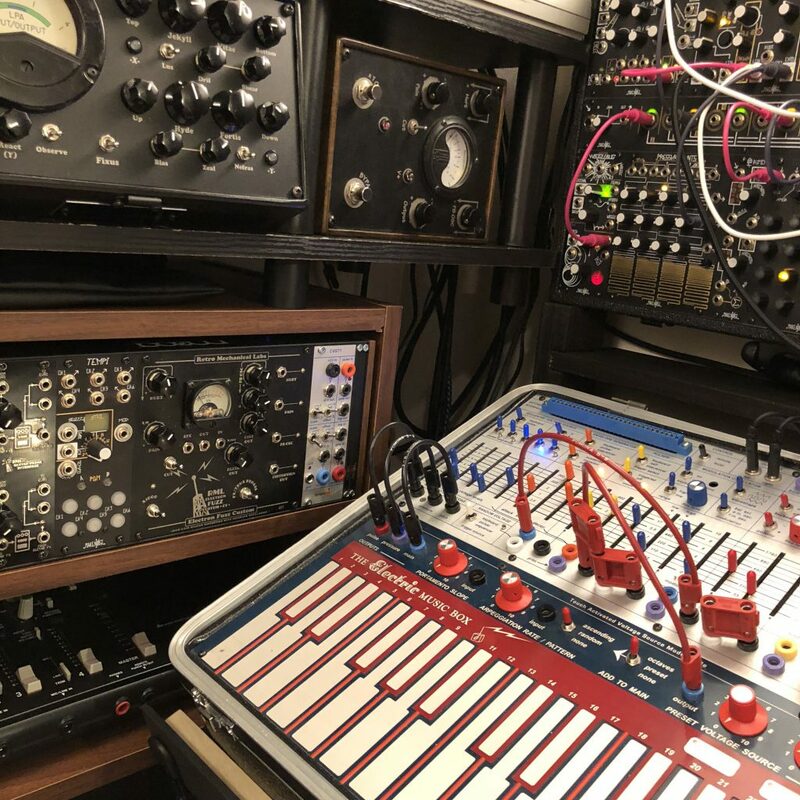 Having it closer to some of my other stuff makes that more possible, and of course the CVGT1 Eurorack module which I’ve under utilized since getting ahold of, it’s now right there between the two and I can definitely see using it more often. That said, the whole point of this month long project was to dig into the Easel more, so I kind of took a few steps backwards by doing all this other work but it’s good to scratch creative itches every once and a while and I finally recorded something tonight which I haven’t done since moving to Tokyo so I’d say that’s a success right there. 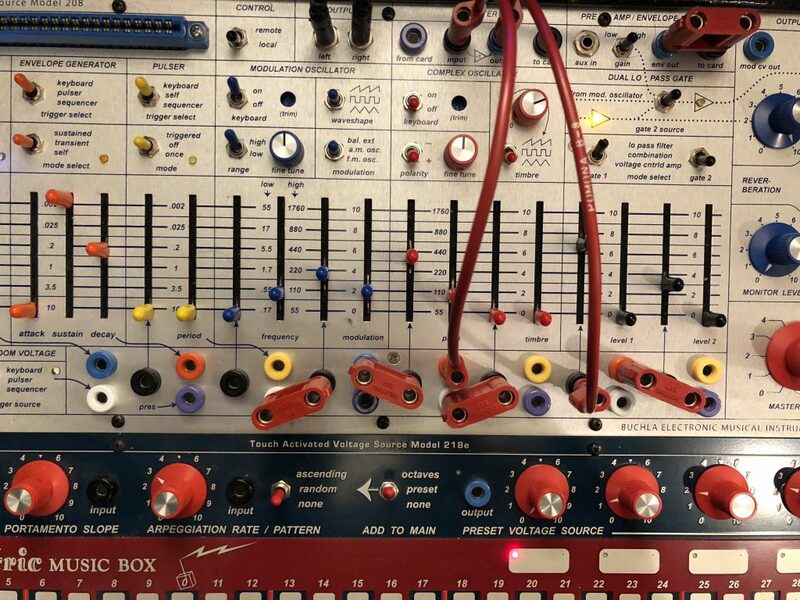 Tomorrow I’m back into the Buchla. Early on Today I had one of those realizations of things I already knew in one context but hadn’t considered in another. When I think of CV, I think of quantized or gates, of tones and pulses. Of course I know that any wave with enough of a peak can also be a pulse, but That didn’t really click for me until I was trying out a patch on my eurorack system and used a triangle as a clock. When I did this I had a huge “Oh!!! I can do that on the Buchla Music Easel too! !” moment. Of course as luck would have it I was running out the door when I realized that and didn’t get to try it out until hours later but of course it worked perfectly. Using the Mod CV out I was able to send a triangle wave from the Mod Oscillator to the CV in on the mixer for the Complex Oscillator and it worked. Now I have to think about how to utilize this better, and how suddenly having only one voice changes things, but it’s certainly a new field of options I hadn’t considered. Music Easel folks, if you have any suggestions where I should run with that, please don’t hesitate to post them. Day 6 & 7 in my Buchla music easel project were videos of an atmospheric set up doing its thing. I had a really long pulse driving the sequencer which is was to 5 steps, but only one of which is sending a pulse to trigger the envelope generator which has a really long attack and decay. A subtle pattern is running on the sequencer to manage the pitch of the complex oscillator, mod osc is keyboardable should I feel like it. The easel is then running into my Retro Mechanical Labs JnH distortion then into a totally cranked Strymon Blue Sky. I’ve had this patch just running for the last hour or so. Day 8. I tuned my Music Easel today. I’ve never done that before and many Easel owners I’ve spoken to haven’t either. I guess is assumed it would ship from BEMI all set and ready, and I don’t know if it gets out of time by moving it or anything but it was definitely off and I don’t know how well I did but I tried. You can tune it by adjusting the little trim pots on the complex and modulation oscillators, watch Todd Barton’s video on YouTube for the specifics though I can’t tune by ear so I used an iPhone app. In fact it made me wonder about my other synths and if I can/should tune them, though I don’t know how either. I recall a conversation in the mid 90’s with a band I was working with who had just come back from the studio, their first time recording with Protools. The guitarist pointed out that while the tracks sounded amazing, because they were able to find the perfect note and then sub that in any time it was used in the song, he also felt that they lost something because they were too perfect, and didn’t have that human hand in there. That’s one of the things that attracted me to analog synthesizers, besides not really being able to play anything else, but the ability to cast away the expectation of perfect recall. Ideas are transient, and even if you find something you love you better record it because it’s never going to be exactly the same. The ability to play it out a little differently each time allowed me to have more fun with it. 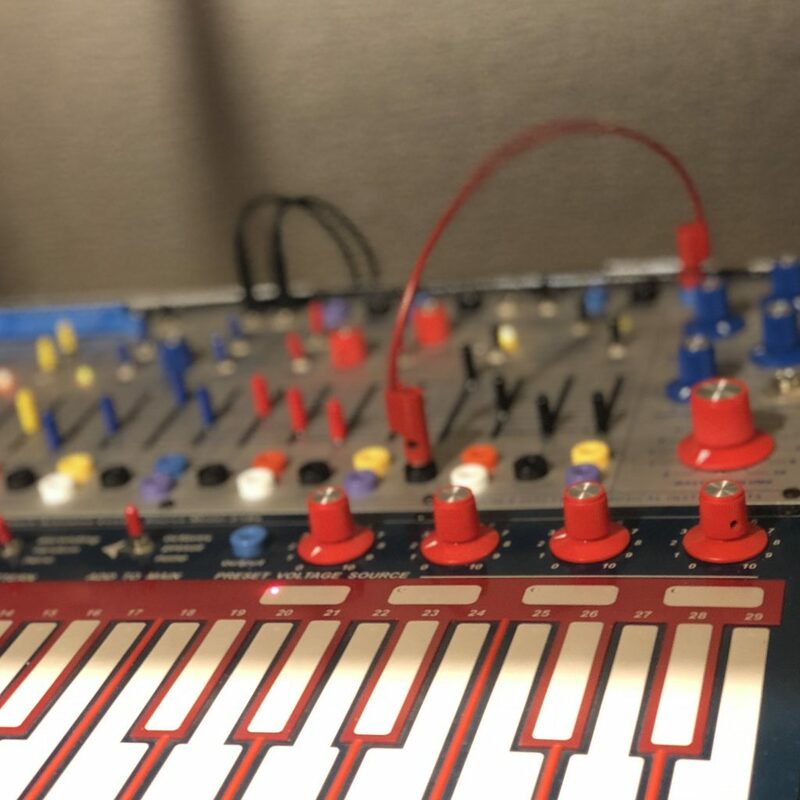 Jump back to the early 1970’s when the Buchla Music Easel was being designed, Don Buchla wanted to have some kind of preset ability to help a musician get where they needed to go quicker during a performance. So he designed in these program cards. If you think of a live situation, having to pull all patch cables and reset each slider and switch to go from one track to another might be problematic, but being able to swap in a card that did a lot of it for you would go a lot quicker. 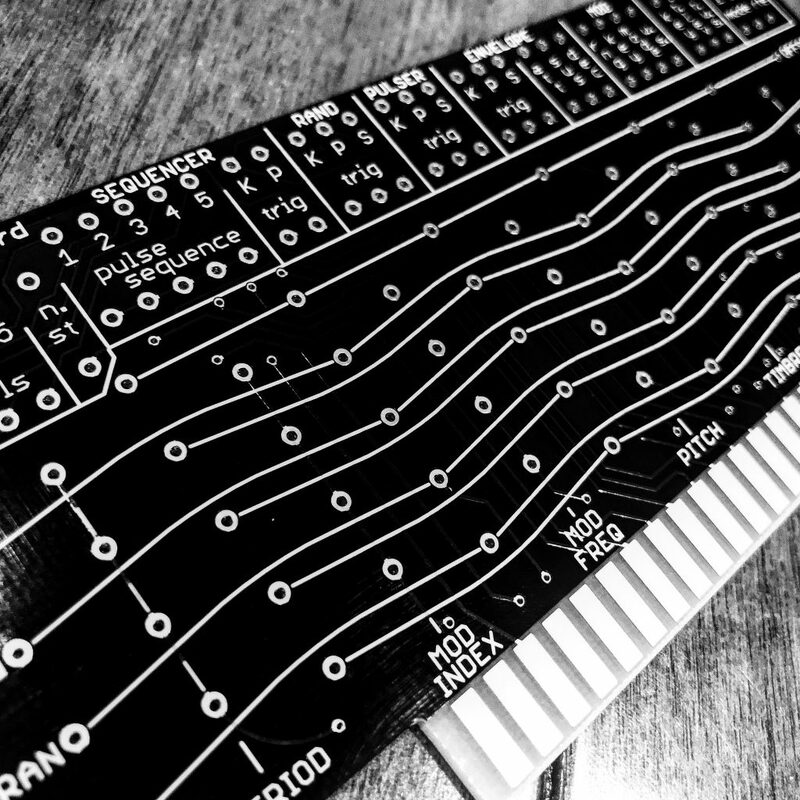 The way these work, is each through hole represents something in the synth, and you’d solder in resisters between the points to build out different patches. A 10k resister would be a different slider position than a 100k resister soldered to the same spots. It also allowed some controls that weren’t able to fit on the Music Easel panel. I’ve got a stack of these program boards that I keep meaning to mess with, and haven’t ever gotten around to. I feel like I want to understand the instrument better on it’s own before I dive off that cliff. So I’m not intending for this project to be a history lesson so much a forcing mechanism for myself to focus on something and see where it leads. Today I only spent a little time with the easel and that time was more confusing than enlightening so I thought I’d share something I did learn history wise in the last few days. I mentioned that I have one of the “reissue” Music Easels and some of the differences between the new ones and the older ones. When I hear of a “reissue” I tend to think of something that was released and then eventually production stopped and later on someone went back and revisited it. This is what I assumed happened here though I didn’t really understand the scope of the earlier production. As it turns out, only 13 of the original Music Easels were ever made. And of those, each one was made by hand. I spoke with someone today who has seen and worked on 3 of those, and noted that the circuitry on each of the 3 he saw was different, which suggests that of the 13 originals, there are at the very least 3 different versions, though in all likelihood each one was probably a little different. Personally, as someone who has built and released hardware and products, I wouldn’t call that a release. I’d call that a collection of proof of concept prototypes. Or if we assume that 10 of them were the same and the 3 that were observed were the oddballs, I’d still call that a small run not an actually produced unit. But that’s just me. Anyway, that’s only important when you start thinking about differences between “original” and “reissue” without considering the differences between each of the “originals” and what that even constitutes. There are also a handful of unauthorized clones that were produced by various people in the inter-period between when the original idea was shelved and the new one was announced. Unknown numbers and sources, but for sure more than 13. So more knock offs than originals. Anyway… In my BEMI easel (that I have) is the first authorized, produced version of this idea. And kind of shows how special it is. The video above is an album (that I love) by Alessandro Cortini that was composed and performed entirely on one of the original Music Easels (possibly the first one ever made? ), and was absolutely the thing that pushed me to get one. In the few years I’ve had the easel I’ve ever been able to make anything with it that sounds nearly this beautiful.